New Show going up tonight at Hiroki’s in Seattle! Tonight I will be hanging my work at Hiroki’s in Seattle along with the rest of my KAC Print Group. Our group show will be up for a month. Hiroki’s is an amazing dessert cafe. Located at 2224 North 56th Street Seattle, WA 98103. Open Wednesday – Friday 11:30 a.m. – 9:00 p.m., Saturday & Sunday 9:00 a.m. – 9:00 p.m.
Our opening reception will be next Friday 6/18 from 6:30 until 8:30. Hope you can join us!! I happened to come across your Letter to the Editor of Somerset Studio on your blog today. I noticed it was sent to an e-mail address that no longer works. I’ve recently taken over as the editor of the magazine, and while I did not put together the Alice in Wonderland issue in its entirety, I did do the final work on it. Because I’m very new to the magazine, I can only apologize for not crediting your artwork. I’m saddened to see that it happened again in Somerset Studio Gallery. I will be holding a meeting with the other editors to talk about this issue and ways to prevent it from happening again. I hope you can accept my apologies. I will be thinking of a way to run a correction and better this situation. My work has now appeared in your Somerset Studio magazine twice and you have referred to my ORIGINAL linocut artwork as “clip art” or simply not given me the artist credit for the imagery. I wrote specifically with my submission that this was original Alice in Wonderland imagery I was using. In the March/April 2010 edition on Page 118 you wrote next to my art, “Adhere favorite Alice in Wonderland image to wood substrate”. This was not as troubling as the most recent magazine because while you failed to give me the artist credit for my imagery at least you did not refer to it as clip art. 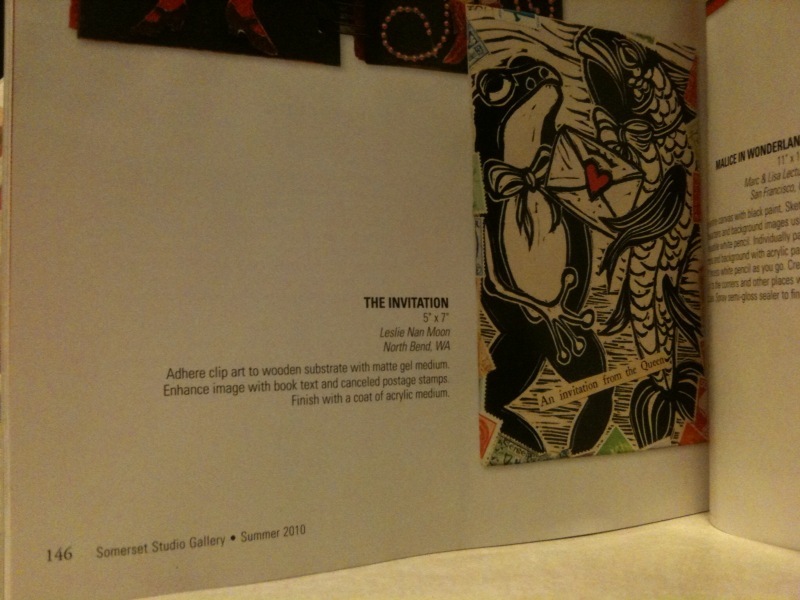 The latest error came to my attention the other day when I received the Somerset Studio Gallery Summer 2010 edition. On page 146 next to my work, The Invitation, you describe my original art as “clip art”. I see in your magazine when others use stamps made my artists you give credit where it’s due. You have not given my original art the credit that it deserves. My linocuts are all original copyrighted work, not clip art, and a correction in your magazine should be printed. This one was a real surprise! Another publication with my work! I just was flipping through Somerset Studio Gallery’s Summer 2010 Magazine and was shocked when I saw one of my pieces there. I had submitted it in October along with the other Alice piece (that one was published in a Mar/Apr. edition so I assumed this piece didn’t make the cut). I do find it annoying that they referred to my art as clip art since it is absolutely NOT any such thing (it is one of my original linocuts) but hey, at least my work is published again in another national magazine! Since this is primarily a collage magazine most of the readers use clip art and stamps which I would guess is why the editors wrote that. You are currently browsing the Lesliemoon's Blog blog archives for June, 2010.